Here is a fun keto-friendly recipe by Australian Eggs that is fresh, delicious and perfect for a summertime lunch or dinner. 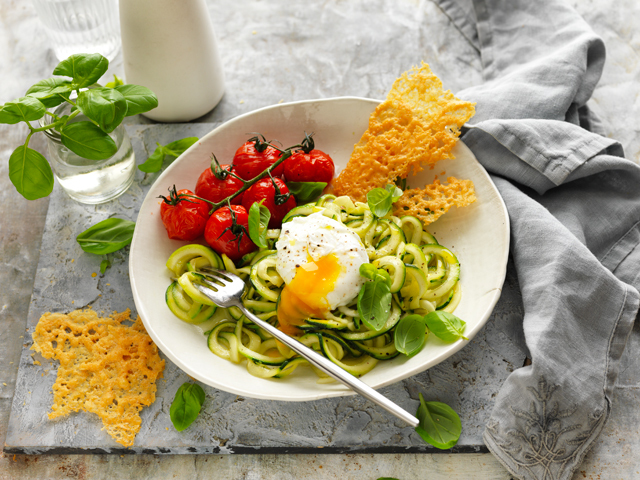 For all those jumping on the keto diet, the colourful zoodles and egg salad brings a fresh burst of 'zoodle-y' flavour and provides a modern twist on the classic Aussie summer salad. Packed full of protein, fibre and other important nutrients, this salad is a fun and healthy way to feed the whole family. Preheat oven to 200°C. Line 2 baking trays with baking paper. Place tomatoes onto one tray and drizzle with oil. Season with salt. Spread parmesan evenly onto remaining tray. Bake for 20 minutes or until tomatoes are tender and parmesan forms a golden melted crust. Break parmesan crisp into large shards. Using a spiraliser, turn zucchini into spirals. Heat oil in a frying pan over a medium heat. Add zucchini and garlic. Cook for 3 minutes or until just softened. Remove from heat. Add basil. Toss until combined. Divide zoodles between serving plate and top each with a poached egg. Serve with roast tomatoes and parmesan crisps.